Hellbound V Book Release Party! 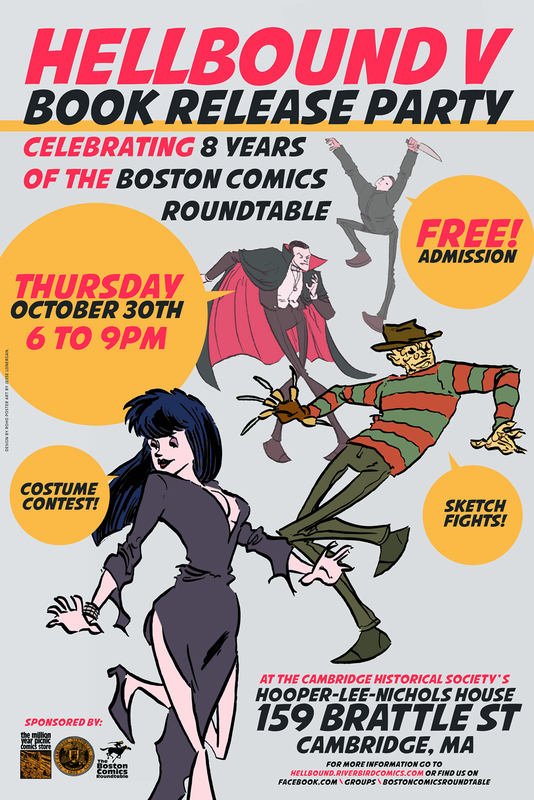 Boston, October 2014 – River Bird Comics and the Boston Comics Roundtable, in celebration of their new Hellbound V: End of Comics anthology, will be hosting a launch party. Free and open to the public, the party will be Thursday October 30th at the Cambridge Historical Society’s Hooper-Lee-Nichols House, at 159 Brattle Street. Festivities will run from 6 to 9 pm. With additional sponsorship from Million Year Picnic and the Cambridge Art Society, the party will feature a costume contest with prizes, Sketch Fights, complementary refreshments, and a chance to meet local comics creators. Costumes are encouraged, but not required. Created in 2006, the Boston Comics Roundtable is a collective of comics creators in the Greater Boston area. Its mission: to network, teach, workshop, encourage, and publish the best and brightest artists and writers in the creation of comics. For more details, and to learn more about the Boston Comics Roundtable, visit www.bostoncomicsroundtable.com.